While I am always surprised by how few singers begin their daily practice with a physical warm-up, I hardly lay the blame at their doors. In my nearly thirty years of studying voice, and my work with ten different voice teachers, not one of them (until my current teacher) began a voice lesson by guiding me through any sort of physical warm-up. I’m sure if I had asked these teachers directly, they might have responded that they recommended various forms of bodywork to help me gain body awareness or reduce tension: Alexander Technique, Feldenkrais, Pilates, yoga, ballet, Dalcroze Eurythmics, etc. But these disciplines (even when they were mentioned—which was rarely) were for me to pursue outside of my lessons, and outside of the practice room. As I did study several of these, I know that they can indeed change a singer’s underlying approach to the body, which affects movement in all aspects of life. But what about the needs of the body immediately prior to singing? What about the needs of a tense singer who has just driven an hour in traffic to reach her teacher’s studio, barely on time? A singer who is tight and anxious backstage prior to an audition or performance? Or one who is feeling tired and under-energized due to a rigorous rehearsal schedule? These are just a few of the many situations in which a physical warm-up can be indispensable for a singer. But if such a warm-up isn’t part of his or her regular routine for preparing the voice, inventing one on the spot when needed is probably not going to happen. “But these are special situations,” you may be thinking. “I don’t need a physical warm-up every day, do I?” There may even be some readers out there who question whether a physical warm-up is ever relevant. “We are small muscle athletes,” these skeptics might insist. “The only muscles I need to warm up are the ones in and around my larynx!” For those few singers blessed with ever-flexible muscles and a naturally balanced body alignment, perhaps this is true. But for the rest of us, probably not. 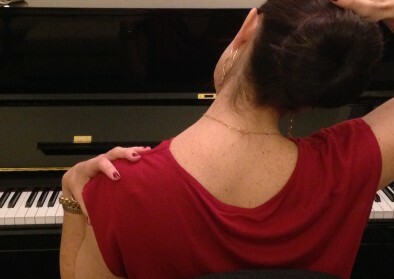 We have all seen singers who are visibly struggling with tension in the shoulders, neck, and jaw. Maybe if we’ve observed closer, we’ve noticed singers with locked hip sockets or ribcages. We have all heard singers who are battling tension in the tongue. (Let’s face it: we’ve probably been one of the above ourselves at some point.) Do we think that these tensions magically appear from out of nowhere, when the person begins to sing? To some degree, singers do adopt specific tensions while singing in the body’s search (albeit inefficient) for balance. But in my experience, just as often, these tensions can be detected in the singer’s body even when they are not singing—and are simply exacerbated when the voice is involved. Clearly, singers’ coordination is impacted by the level of tension or freedom they experience in their bodies during the rest of their lives. The tension a student enters the studio with is most likely the tension he or she will sing with! Given this, it has always struck me that tremendous time would be saved (rather than wasted, as I know is our fear) if singers began to address their physical tensions before they even started to sing. Most of us have some idea of how to stretch these various areas of the body. If not, any one of the physical disciplines above (Alexander Technique, yoga, etc.) can provide a vast array of movements and stretches from which to craft a personal routine. So here is today’s practice challenge. Before you begin your next practice session, spend just five minutes stretching your body, paying particular attention to places where you know you hold tension. Try to do at least one movement designed to release tension or increase range of motion in each of the areas listed above. Then begin to practice vocally. Is your experience different? The changes you perceive may be subtle, but hopefully they will be noticeable enough to encourage you to make a physical warm-up part of your regular practice routine. Your body and voice will thank you. As always, please share your experience or questions. Happy practicing!